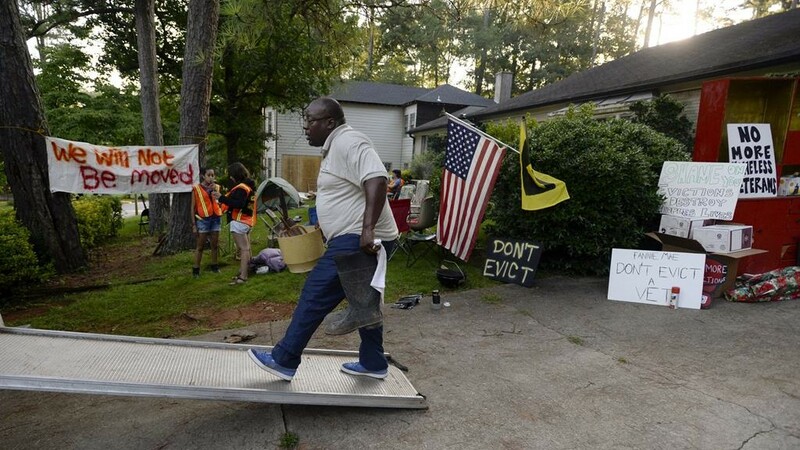 During the Great Recession, some 10 million Americans, a whopping three percent of the population, were foreclosed, evicted or otherwise booted from their homes. It's been one of the quickest and most vicious displacements in American history. And where did everyone go? While sociologists and demographers are just beginning to grapple with the fallout from the foreclosure crisis — no one even knows for sure how many Americans were foreclosed, though the best estimates are about 10 million — it's clear that most of the displaced have stuck close to home. In 2010, the number of "local moves" increased sharply, to 24.2 million, the highest level in a decade. That's unlike the 6 million African Americans who moved during the Great Migrations, which lasted from about 1910 to 1970. They headed to cities in the North, Midwest and West, generally. The 2.5 million people who became part of the Dust Bowl exodus tended to head west, too, often to California. But in the Great Recession, there has been no exodus. No masses have streamed across state borders. At the height of the recession, from 2009 to 2010, only about 10.5 million people moved outside their counties, according to the Census Bureau — the lowest proportion since the bureau started tracking the number in 1947. Instead, the displaced likely moved within their towns and cities. In 2010, the number of local moves increased sharply, to 24.2 million, the highest level in a decade, according to a study by Michael Stoll, professor of public policy at UCLA. Nearly a quarter of them moved for cheaper housing. The shift from regional moves to local moves has partly to do with larger macroeconomic trends. These days, it takes a robust economy to give people the courage — or the secure jobs they need — to face the risk of a long-haul move. During economic downturns, in contrast, people tend to stay put. Jobs are less plentiful, and the risk of moving a long distance without one is too high. "Paying the costs to move [across regions] without a guarantee of employment just doesn't make sense," says Stoll. As a result of the United States' steady economic decline, perhaps, the percentage of moves that are local is increasing. From 1981 to 2005, between 59 percent and 65 percent of moves were local. By 2010, however, 73 percent were. Another reason people stayed close to home is that the recession was so broad. Most regions were hit, and from a job searcher's perspective, there were few green pastures to be found. During previous downturns, some states, including Florida and Texas, received a huge influx of migrants. Not this time: "There was no good place to move to, and some reason to stay," Stoll says. Still, people were forced to move. Residents of some cities appeared to be playing a game of musical chairs. In Las Vegas, for instance, one in five residents moved somewhere else in town between 2008 and 2010, says Stoll. And local moves spiked highest in metropolitan areas like Vegas, where unemployment surged and the housing bubble burst. More from Ozy: Why is Bill Gates investing in an chicken-less egg? But there were exceptions. Detroit lost a quarter of a million residents between 2000 and 2010, says Laura Gottesdiener, author of A Dream Foreclosed, a new book on the subprime fallout. Anecdotal evidence leads her to believe that many of them headed south in a kind of reverse migration. But it wasn't just foreclosure that pushed people out of Detroit, she adds: "It was related to a larger systemic failure in the city, accelerated by the housing crisis." There is little data on what happens to foreclosure migrants. A 2011 study by the Federal Reserve argues, surprisingly, that while foreclosure raises the chances of moving, most postforeclosure migrants don't end up in "substantially less desirable neighborhoods or more crowded living conditions." But the study neglects to take into account other costs. Being foreclosed during a housing crisis means not only losing the equity in your house, but also often entering the rental market right when competition is fierce and prices are skyrocketing. "So at a time when you want to downsize, you end up paying a lot more for rent," says Gottesdiener. Forced moves disproportionately hit African Americans and Latinos, according to the Center for Responsible Lending. It documented 790 completed foreclosures per 10,000 loans for African Americans and 769 for Latino Americans, compared with 452 for white, non-Hispanic Americans. Most of those loans originated in the subprime heyday of 2005 to 2008. The disproportionate effect might be because racial minorities were not as successful at renegotiating their mortgages, Stoll says. But it's also because African Americans were much likelier to be sold predatory mortgages in the first place — three times more likely, according to Gottesdiener, even if their credit scores were as good as similarly situated white Americans. Like many of those who lost out in the recession, they were easy to find back in the subprime boom, but not so easy now.